The Ecopure Eco-8 Inline Water Filter with 1/4" Push Fittings is an under sink water filter which can replace your existing in-line water filter with 1/4" Push Fittings or it can be used as a replacement for your fridge filter. Unique: Unique filtration method produces gentle, soft, non-scaling water.Removes/Reduces:Chlorine (99% removal in both hot and cold water), Fluoride, THM’s, PCB’s, Lead, Arsenic, Barium, Cadmium, Chromium, Selenium, Mercury, Iron and heavy metals. Produces alkaline water which may help eczema sufferers and those with chlorine intolerance and allergies and reduces fluoride. Construction: White ABS, does not rust.Media. 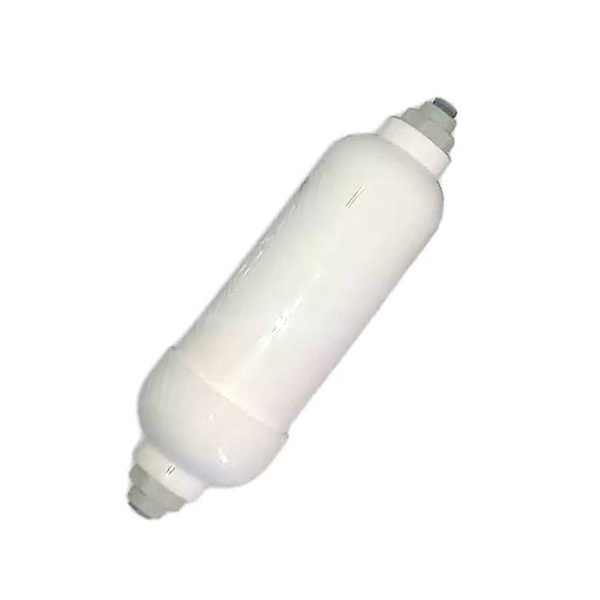 Active ceramic spheres are porous and absorptive, and filter effectively to 1 micron. The ceramics control and eliminate bacteria growth, removes/reduces chlorine and heavy metals, prevent build up of scale in pipework and appliances, and remineralise water with nutrients. Approvals: The active ceramics have won NSF 42 approval. This is the internationally recognised American standard for drinking water media and products. The material of the spheres is also approved by the Water Research Centre under the Water Bylaws scheme for use in contact with potable water. 12 month longlife drinking water filter for healthy, purified water. 12 month guarantee. Life of filter may vary depending on water hardness and local water quality. Alkaline, filtered water which removes and reduces contaminants such as chlorine, heavy metals, bacteria, reduces fluoride, toxins and VOC’s.